Oh look, another brilliant orator sits during the national anthem to make some point about something. This post will contain more vitriol than others, because I’m sick of this nonsense. Sick of the halfwit players spewing idiocy in defense of their atrocious actions, and sick of the fawning media pretending these spoiled brats are doing something noble. So let’s set aside just for the moment the incontrovertible fact that these ignoramuses are just trying to start a conversation and change things based on complete lies in support of an organization which has directly led to rampant destruction and indirectly killed people. Let’s just ignore those minor details right now and focus on how these glittering jewels of ignorance and hypocrisy are choosing to make their point. The obligatory 9/11 remembrances on the Sunday morning pre-game shows ring hollow when the talking empty heads are also offering unthinking platitudes to those who show such disrespectful disregard for the flag and those who serve. Victor Cruz reading letters from 9/11 victims stands in stark contrast with Michael Strahan defending this nonsense because they have a legitimate point and are starting a broader conversation, or Jay Glazer reporting Colin Kaepernick is no longer a pariah in the 49ers locker room with the team rallying around him. The men who raised this flag didn’t give a damn about race. Their friends and colleagues didn’t give a damn about race when they rushed into a tower inferno to save innocents indiscriminately killed and maimed by 13th century barbarians. Everyone of them wore this flag, this supposed symbol of hate and oppression, on their shoulders when they made uncommon valor commonplace that day. 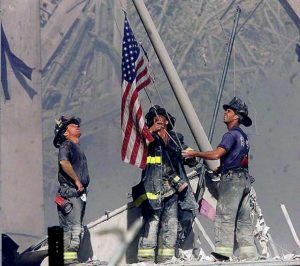 They raised that flag as a declaration of resolve and a symbol of all that is great and good in us. And with your protest, with your making a point, with your trying to start a conversation, you spit on it and them. You spit on them as surely as your intellectual fore-bearers spit on those who wore it and fought for it in Vietnam. Tell me how your disrespect for the flag is any better than those who burnt it in the name of peace. The only difference is one of degree; the sentiment is the same. And after some time had passed, after the Left realized they could monetize the mess they themselves created, they began to put the abused and disaffected Vietnam vet in media to shame us all and teach us a lesson that we should never again do what they themselves did to abuse an entire generation of heroes. But now political opportunism rears its ugly head and disrespect of the flag and that for which it stands is once again a cause celebre. Sixty years ago, in the face of racial oppression enshrined in law by the Supreme Court, black Americans still signed up in droves to serve under this symbol of racism and oppression. More than signed up, they fought and pressed for the right to fight, to put their lives on the line rather than being relegated to only support roles thanks to the segregation of the Armed Forces imposed by Leftist icon Woodrow Wilson. Tell me millionaire infants, what comparable oppression have you suffered? In the face of real systematic injustice, your grandfathers not only swore an oath to serve under the flag you hate but also went above and beyond. When fighting in the Pacific grew fierce and casualties mounted, black Marines who had been limited to things like stretcher bearers and supply runners did not hesitate to put their bodies on the front lines, shoulder to shoulder with white Marines. In Europe, black soldiers kept the front moving with round the clock work in the face of harsh conditions and enemy action through the Red Ball Express. Every one of them served under the flag you now despise all while facing conditions at home which would reduce these precious snowflakes to a blubbering, sobbing mess. Though born a slave, William Carney had more respect for the flag of his country than pop culture heroes being paid millions of dollars to play a game. Though grievously injured, William Carney refused to let himself or the flag fall because he knew who and what it represented. It represented the hundreds of his brothers who fell it that fateful assault; so think of them the next time you decide to make an incoherent point by sitting during the national anthem you self-righteous prima donas. It represented the best of America and its founding principles which set it apart from every other nation in human history; so think about that the next time you decide to turn your back on the flag you ignorant P.E. majors and faux journalists. If you think you have a legitimate point to make, you don’t do so by being a classless jerk. If you say, “No offense, but you’re a fat, ugly, idiot,” I’m still going to be offended; so much more so if it’s completely and provably untrue. You don’t flirt at a funeral because it’s socially disgusting and cruel to those dealing with a loss. You stand for the national anthem in honor of all those who stood against danger and tyranny for the whole nation. You respect the flag to respect those who put service before self, often paying the ultimate price. It’s long past time the sycophantic enablers in the media stopped pandering to these people and call them what they are: spoiled brats throwing a tantrum while standing on the graves of America’s best.